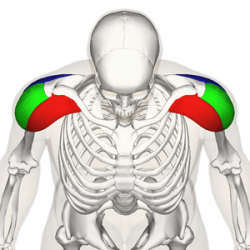 The Deltoid muscle is a large triangular shaped muscle which lies over the glenohumeral joint and which gives the shoulder its rounded contour. It is named after the Greek letter delta, which is shaped like an equilateral triangle. It comprises 3 distinct portions each of which produces a different movement of the glenohumeral joint, commonly named the anterior, mid (or lateral) and posterior heads. Lateral third, Anterior Surface of the Clavicle (close to the lateral fibres of pectoralis major). Spine of the Scapula, Posterior Border. Fibres from all heads converge to insert into the deltoid tuberosity on the humerus. The deltoid fascia is continuous with the brachial fascia and connects to the medial and lateral intermuscular septa. Axillary Nerve, C5 & 6, posterior cord of the brachial plexus. Deltoid receives its blood supply from the posterior circumflex humeral artery. An important function of deltoid is the prevention of subluxation or even dislocation of the head of the humerus particularly when carrying a load. 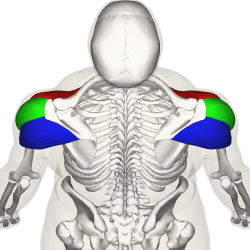 Deltoid is the prime mover of shoulder abduction. 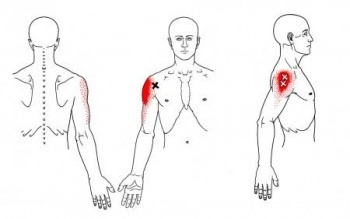 Flex elbow to 90 degrees and have patient abduct the shoulder against resistance. Deltoid palpated with elbow extended, shoulder 90 degrees abduction and then resist horizontal adduction. Position same as above and then resist horizontal abduction. Lie down flat on your back, with a pillow supporting your head. Bend your elbow as far as possible. Then raise your arm to 90 degrees vertical, using the stronger arm to assist if necessary. Once you have got to 90 degrees, you can straighten your elbow. Hold your arm in this upright position with its own strength. Circles: Slowly with your fingers, wrist and elbow straight move the arm in small circular movements clockwise and counterclockwise. Gradually increase the circle as comfortable (this may take a few weeks to increase to bigger and bigger circles). As you get more confidence in controlling your shoulder movement, a lightweight e.g. a tin of beans or small paperweight, should be held in the affected hand. Having more confidence in controlling your shoulder movement gradually go from lying down to sitting and eventually standing. At this stage you may recline the head of your bed or put some pillows underneath your back to recline your position. Repeat the same exercise again, this time against some gravity. Start again from holding your arm in the upright position with its own strength. Start first without any weights and progress to use the same lightweight you used before in the lying down position. For re-education of concentric contracture of the deltoid muscle. Make a fist with the hand of the affected side. The flat hand of the opposite side is providing resistance. Push your affected side hand against resistance from the other hand. Whilst doing this, you will notice that you can fully elevate your arm (above your head). 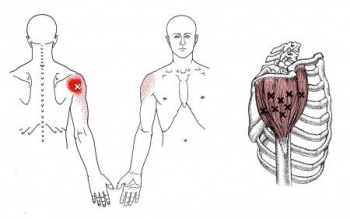 Repeat these exercises in order to ‘learn’ and re-educate your Deltoid muscle to perform this ‘concentric contracture’ even without pushing against your other arm.